A tradition since the 1950s, the Plantation Suppers treat guests to good food, sunset views and Sea Island hospitality. As the sun sets on the coastal marshes during special evenings at Sea Island, the smells of barbecue and sweet pecan pie, and the sounds of a guitar and jovial socialization linger. These nights, the Plantation Supper takes place on Rainbow Island, preserving a unique tradition created more than a half century ago. The Plantation Suppers’ roots trace back to the 1950s, when The Cloister began hosting a barbecue and fish fry on Friday nights. 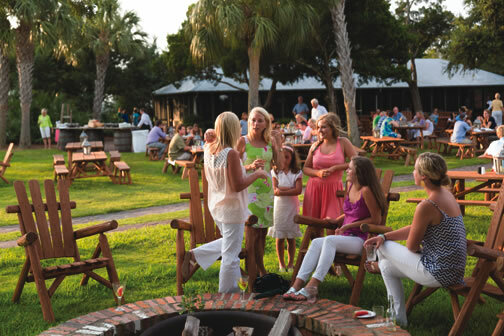 Folks would hop aboard the Jeep Train and make their way to the live oak grove on the northern end of Sea Island for Southern food, Sea Island hospitality and the pleasant sounds of local singers set against the backdrop of the Black Banks River. “Back in the early days, we would have some entertainers singing some of the old-time [folk songs] like ‘Just a Bowl of Butter Beans,’ and other old Southern songs,” says Merry Tipton, Sea Island director of marketing communications. Red-and-white checkered linens adorned each table, and men, women and children left formalwear behind in favor of breezy garments suitable for playing, walking along the beach and, of course, eating. 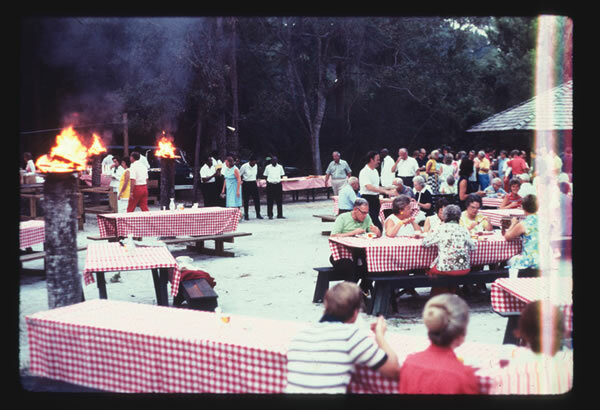 By the 1960s, the gathering was known as the Plantation Supper. Fast-forward to the mid-1990s, and the dinners were relocated to Rainbow Island, near The Cloister, where they take place today. Guests still hitch a ride on the Jeep Train to the venue, where they continue to enjoy the same unforgettable Georgia sunset views that the diners who came before them gazed upon in the 1950s. Gone are the checkered tablecloths, but wooden picnic tables and the carefree spirit of the suppers remain. There are now more fire pits to gather round because, as Tipton says, “There’s something special about a campfire.” A covered seating area and a playground also have been added. Today’s suppers are held on Rainbow Island. And while folk favorites can still be heard on occasion during supper, the live entertainment is more often in the form of musicians on banjos, guitars and keyboards. One thing that has remained almost remarkably unchanged since the suppers’ beginnings is the focus on food. “There’s a grand similarity between the menus of yesteryear and the menus of today,” Tipton says. Just as guests from years past sat down to plates of hush puppies, roasted oysters, shrimp, coleslaw, fried chicken, sweet potatoes, corn pudding, and macaroni and cheese, guests continue to enjoy these classics today. New healthy options have been added, such as tomato salad and zucchini and yellow squash, but guests continue to find it hard to resist a slice of pecan pie, always a Sea Island staple.